With so many openings in the Vancouver dining scene, it's hard to find new niches. If there's one neighbourhood that welcomes food of all cuisines and styles, it's the West End in Vancouver. Hot off the heels of a plethora of Indian-style eateries opening in Metro Vancouver (e.g. Tandoori Flame, Tasty Indian Bistro), Davie Street has recently witnessed the arrival of Mumbai Local, a street eats style eatery with the vibe of a Mumbai Central West vibe. I had a chance to visit a couple weeks and introduced a lot of new foods into my culinary journal that I can't wait to share below. Hailing from the chaat (snack) section of the menu, the dahi puri was first out of the kitchen. A set of hollow crackers stuffed with potato, onion, sev (chickpea noodles), tamarind, and chilli chutney, these felt like the Indian-equivalent of arancini or takoyaki balls. I enjoyed the small burst of flavour when biting into each ball. Moving onto the street eats section, we had the chicken lollipops, chicken Manchurian dry, and prawns rava fry. The chicken lollipops were winglets served with a schezwan chutney and cabbage slaw. Shades of Chinese cuisine shone in this street eat-friendly chicken. The sauce had a good amount of heat and the chicken juicy with a crisp baked finish. The chicken Manchurian dry had chicken cooked in Indo-Chinese manchurian sauce with scallions and cilantro. If the North American-style of ginger beef had a chicken cousin with actual Asian heritage, this chicken Manchurian was that heritage. The saucy finish on this boneless chicken had a light stir-fried char and a sweet finish in each bite. The best textured dish of the night and my favourite item overall was the prawns rava fry. Dusted with a semolina breading, these prawns were extra juicy and filled with gritty texture in every bite. As I'm writing this paragraph I'm thinking back to how good this dish was and hoping I remember this name if I ever have the chance to visit Mumbai. Moving onto the dinner section, the fish aamti was our dish of choice. 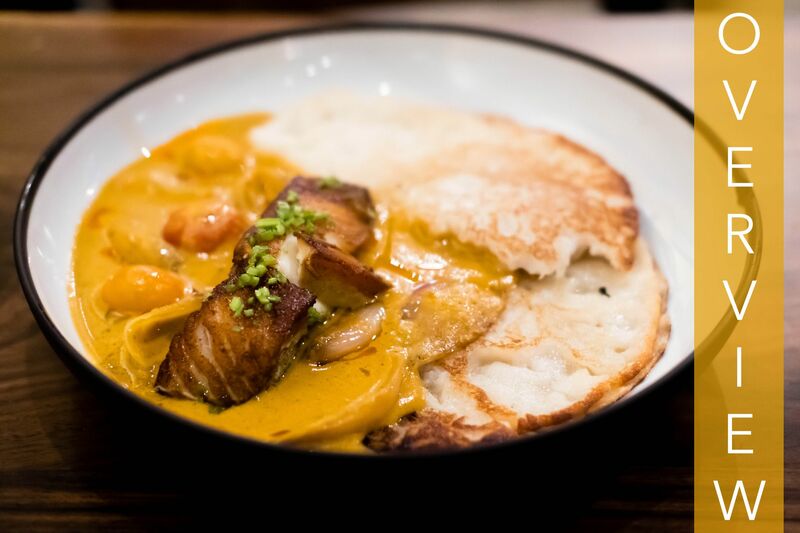 This was pan-seared sablefish cooked in tomato, traditional spices, kokum (citrus fruit), and served with rice pancake. The sauce was a tangy yellow colour with the aroma of tomato mixed in with a ton of spices I couldn't identify, but it was comparable to an aromatic Indian curry (fun fact: they don't call it "curry" in Indian cuisine). Sablefish in itself is a buttery fish that needs little seasoning to taste good and that was the same case here. To finish the meal, we enjoyed a shrikhand, sweet hung yogurt topped with dry fruits and mango. The hung yogurt had a pleasant mix of sweet and sour properties that were combined with a nutty pistachio mix and mango puree. This was a cool deviance from Northwestern desserts that usually use cream to present desserts. Not the case here and I love that this restaurant preaches its own vision in every section of the menu. Mumbai Local takes up residence in a dense restaurant section of the West End along Vancouver's Davie Street. Within is a modern look with bar seating, high tables, and regular table seating which can seat around 80 guests. The main highlight is the bright wall mural stretching down the main length of the dining room. This mural is completely handpainted and if you get up close, you can even spot some individual brush strokes. The vibe inside Mumbai Local is that of a casual eatery with dim lighting and ambient music. The restaurant sits at the corner of a complex with lots of windows providing a good opportunity for people-watching if you come during the day.